Demand for new cash management offerings is on the rise as vendors’ user-experience enhancements offer banks strong options. Boston, May 26, 2016 – The U.S. cash management industry is enjoying a rising number of new technology contracts as a result of growing customer demand. These opportunities are also creating a more competitive environment for technology providers while forcing some to alter their strategies and build out their offerings. Clear winners are beginning to emerge, while others are looking for areas in which they can carve out a niche. 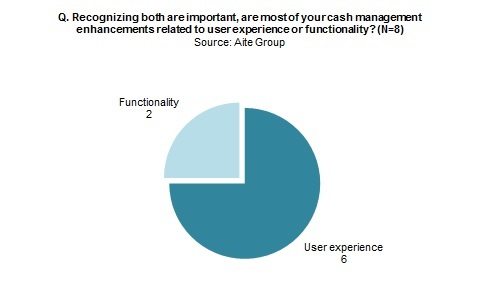 This report analyzes the key trends shaping the cash management technology industry and the leading providers driving that change, and profiles eight leading cash management vendors serving the U.S. market: ACI Worldwide, Bottomline Technologies, D+H, FIS, Fiserv, Intellect Design Arena, Online Banking Solutions, and Q2 Holdings Inc. The research is based on the results of an in-depth Aite Group request for information process with leading U.S. cash management vendors and product demos from February to April 2016. This 66-page Impact Report contains 14 figures and nine tables. Clients of Aite Group’s Wholesale Banking & Payments service can download this report.